To welcome the holiday season here in the UAE, Marina Home Interiors teamed up with two of our favourite stylists to create inspiring Christmas ideas for The Good Life. Using beautiful wreaths, furniture, decorations and baubles from Marina Home Interiors, stylists House of Hawkes brought their ‘Woodland Dreams’ to life, with a rich colour palette of deep blue, burnished bronze, antique silver and raw timber. House of Hawkes showcased its signature pared-back style, offering a more minimalist approach to Christmas décor with gold Ayal reindeer statues and an eye-catching one-metre-tall blue resin parrot, offering a contemporary twist on the festivity and warmth you’d expect from the holiday season. 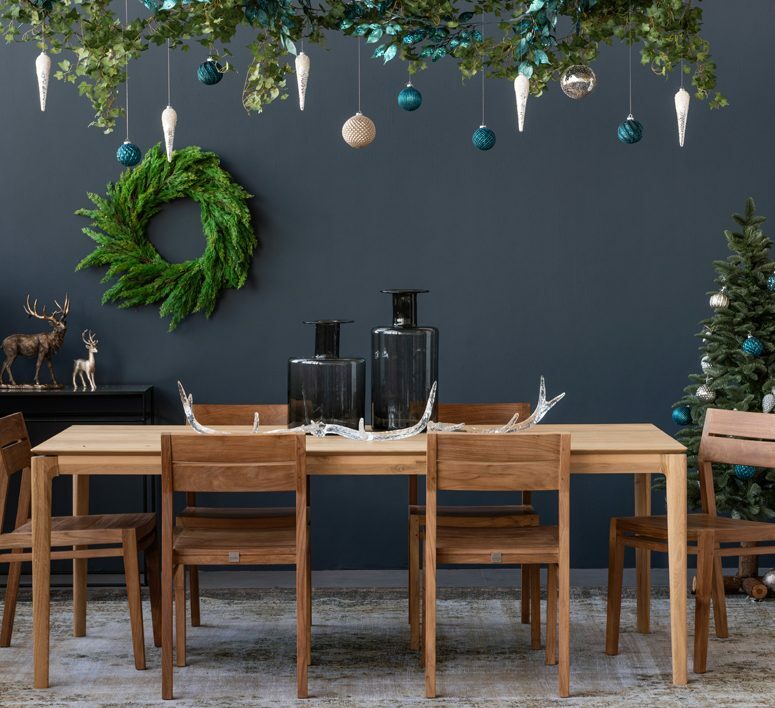 The bare timber table is adorned with striking Banja glass antlers that offer a nod to festive reindeer, while lush wreaths, trees and Blits Garland foliage evoke the whimsy of a wintry forest scene. The same pared-back styling has been applied to the trees, which are adorned with large Azul glass and beaded baubles in rich shades of teal and antique silver. For the second festive scene, stylist and content creator Tjaša Džafić brought the spirit of a traditional European Christmas to life with her ‘Notes to the North Pole’ collection. Here, Tjaša showcases Marina Home Interiors’ range in the classic Christmas tones of gold, red and green. Notes to the North Pole is a celebration of texture, with white stone, rich brown leather and a stunning couch in a forest green velvet. The Marina Home Interiors decorations bring together the old-school Christmas vibes of Wizzy bird and Trixy owl statues with candles and books create a warm, evocative space that feels at once vintage and on-trend.